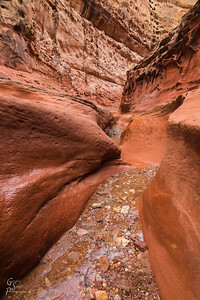 Capitol Reef national park landscape gallery: includes Notom, Fruita, Capitol Gorge, Spring Canyon, Sulphur creek. 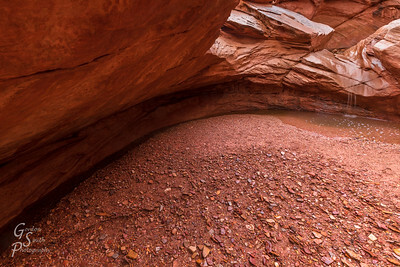 The Way of Water: a small seep drips down a small shoot but then makes a giant curve around pebbles accumulated in the basin of this wash. 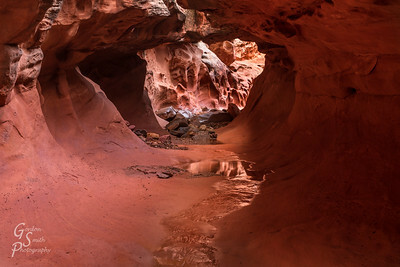 Crack Canyon Light comes through a long tubular subway-like canyon. 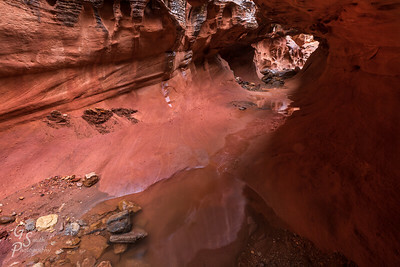 Water seeps here. 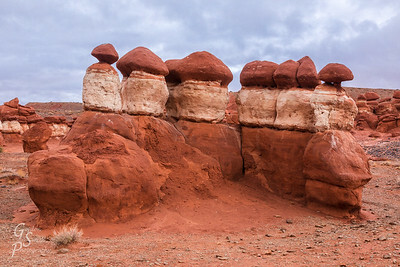 Crack Canyon Crack: here we see the "crack" of Crack Canyon. Pretty deep and impressive. 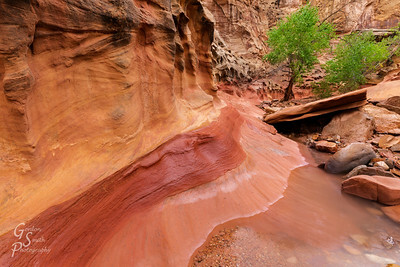 Crack Canyon Hiking beside the "crack"
Unusual Conglomeration with colors, boulders and cottonwoods. 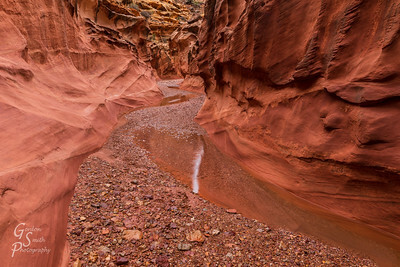 Curve in Crack Canyon fills here and there with water during a rainstorm. 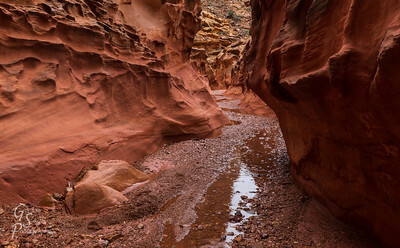 Crack Canyon Walk in Rain during a fall storm. 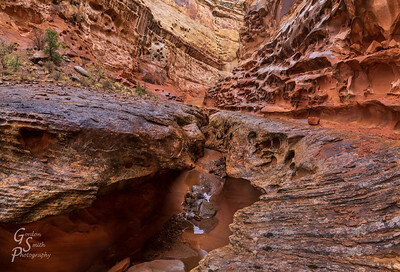 Crack Canyon near Capitol Reef: this is near the "behind the reef" trail. 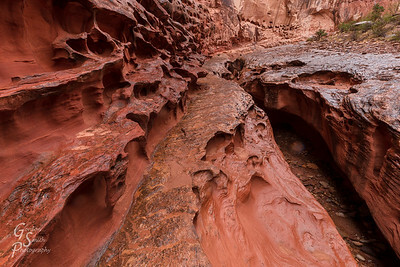 Crack Canyon Tunnel within the "crack". This is a new exploration place! 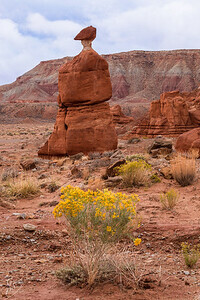 Flowers for the Queen of Little Egypt: Little Egypt geologic area of interest as seen on a pleasant but cloudy day. 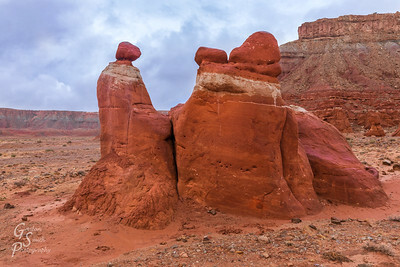 This high hoodoo is known as the queen. 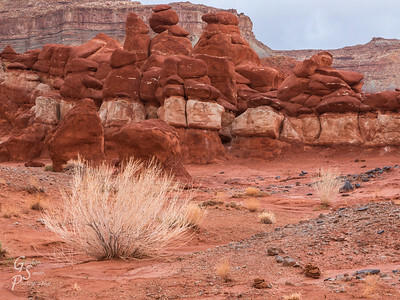 Sage and Queen: sagebrush and the Queen structure at Little Egypt in Utah. 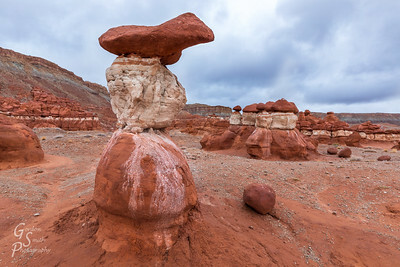 Queen of Little Egypt in Utah, landscape photography by Gordon Smith of St. George, Utah. 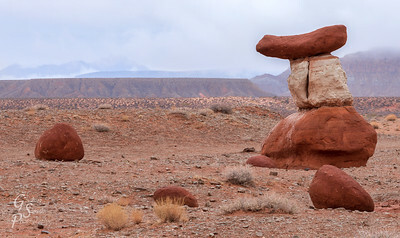 Octopus of the Desert: a weird structure in Utah's central high desert. 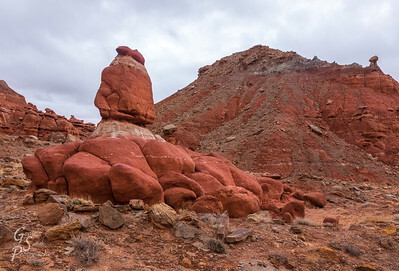 Octopus and Queen, Little Egypt Geologic Area. 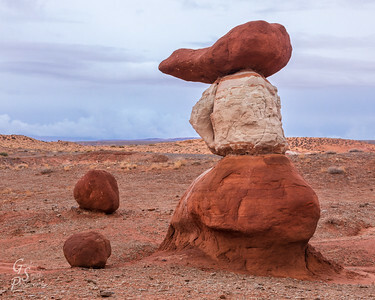 Little Egypt Boulders and Hoodoo in the high central Utah desert. Little Egyptian Heads putting their heads together. 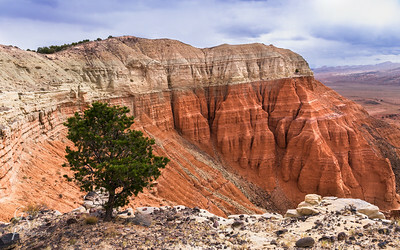 This weird spot in central Utah has great hiking and photography. 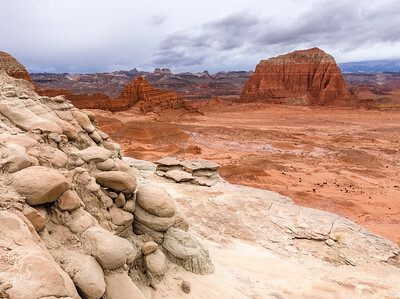 Hoodoo of Egypt: Utah's Little Egypt is a gem to visit. 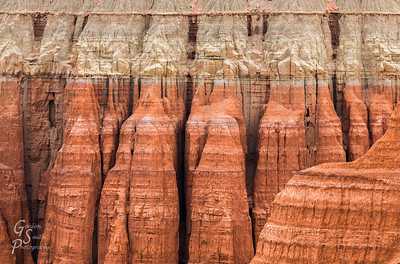 Wonderful stripes of color run through these goblins. 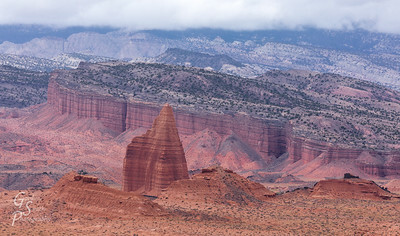 Giant Monolith of Upper Cathedral Valley: hike to the end of the Upper Cathdral trail to see this view of the largest "cathedral. 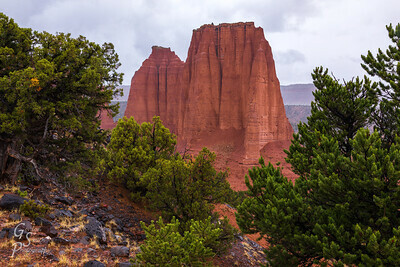 Rain fell on me and small run-off can be seen around the monolith. 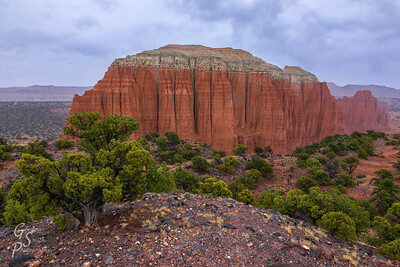 Upper Cathedrals of Capitol Reef. 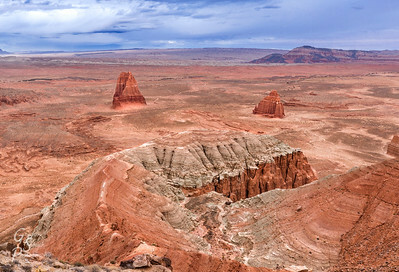 A 2 mile hike leads to this spectacular overlook! 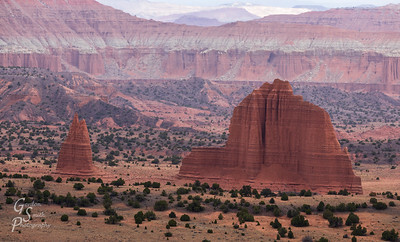 Cathedral Over the Valley: towering above everything, this steep monolith commands the world. 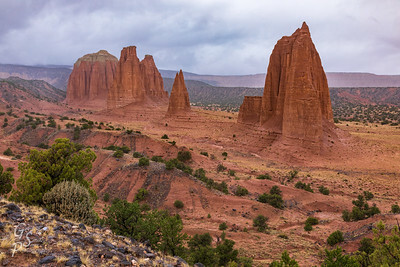 Upper Cathedrals Trail has views of a succession of impressive towers. 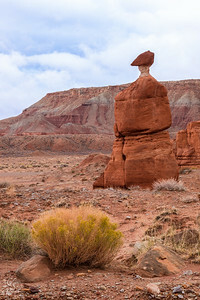 Jailhouse Rock Landscape: a mis-shapen rock in the foreground resembles a bicycle seat to me. 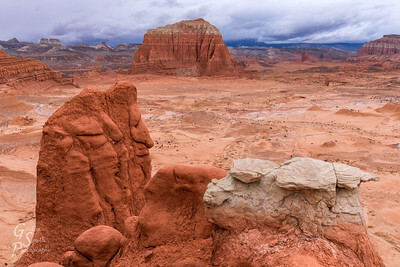 Lower South Desert Overlook in Capitol Reef's remote northern section. 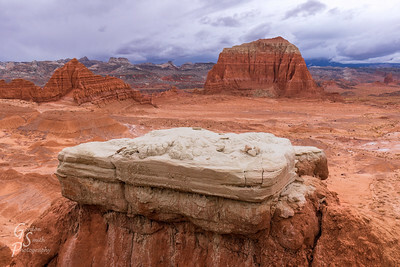 White Altar: Lower South Desert Overlook in Capitol Reef has this wonderful open view of Jailhouse Rock and many other strange stones. 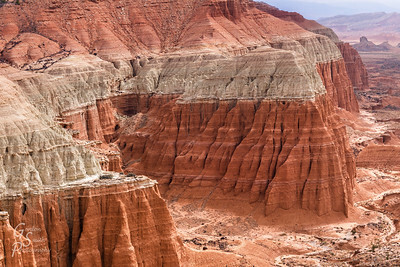 Overlooking Temples of the Sun and Moon: from the Upper Cathedral road there is a one-mile trek to a view above the famous Temples of the Sun (left) and Moon (right). 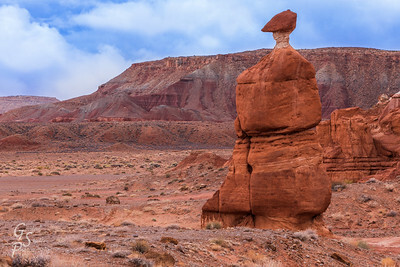 The immensity of Utah is wonderful! 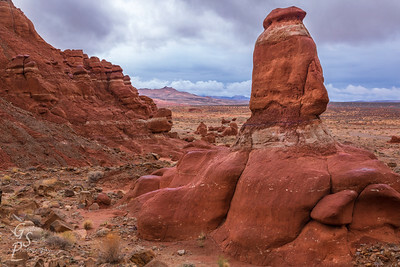 Cathedral Cliffs of the lesser-known South Desert. 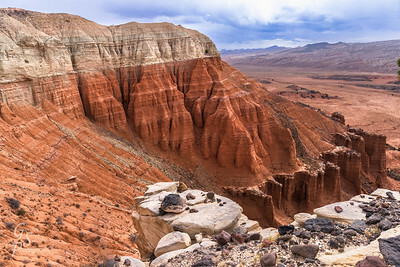 This stunning valley is on the opposite side of Cathedral Valley in Capitol Reef. 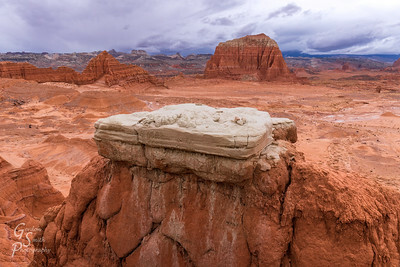 Pedestal Over South Desert with Cathedral Valley sandstone cliffs melting with time. 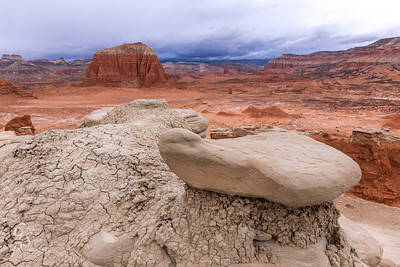 The topmost white Curtis formation is easily seen here. 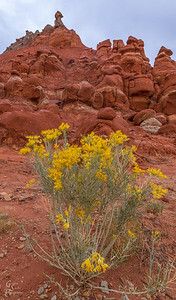 Tree Over South Desert in Capitol Reef. 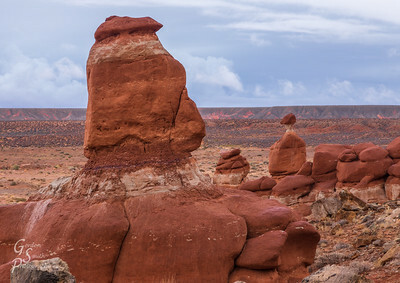 Cathedral Sandstone Detail: whiter stone on top is Curtis formation. 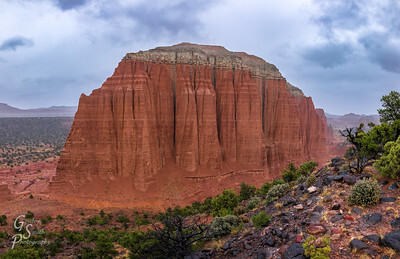 Upper Cathedral Storm, a telephoto shot.